Helsinki Energy Office Building was designed for Helsinki Energy, former The Office Building of the Helsinki City Electricity Company. It is located in the the city centre of Helsinki, in Kamppi area. The building’s location is part of Aalto’s city-centre plan from 1961. Together with Finlandia Hall, Helsinki Energy Office Building is the only building realised part of Aalto’s city-centre plan. The designing process started in 1965 and the building finished in 1973. Aalto designed the new building to form an integrated architectonic whole with the electricity substation already on the site from 1939. The electricity substation was designed by Gunnar Tacher. The buildings are linked by the line of their roofs. Therefore Helsinki Energy Office Building is a good example of the seamlessly combination of a new building with an earlier one. Helsinki Energy Office Building is nowadays a substantial part of the Kamppi cityscape. Apart from housing the company’s the head office, the building also has the main electricity and heat-generation control rooms, the electricity substation and the customer-service department. The street level was to be the customer-service floor, while the upper floors were reserved for offices. There were conference rooms on the top floor, plus the staff restaurant. The street-level customer-service hall got natural light from skylights, which resemble the ones that were also used in the National Pensions Institute building in Helsinki earlier. Helsinki Energy Office Building was also a total work of art for Aalto’s office, therefore all the original interiors were also designed by Aalto. Over the years the interiors have been changed but in some spaces they have restored the furnishings back to the originals. The façades of the building are corrugated sheet copper and the current façade lighting is from the 1990s. Glazed blue and white ceramic tiles designed by Aalto were used for the interior walls of the building. Helsinki Energy Office Building is well-preserved in its original state as it has been in the care of its single owner for over 40 years. 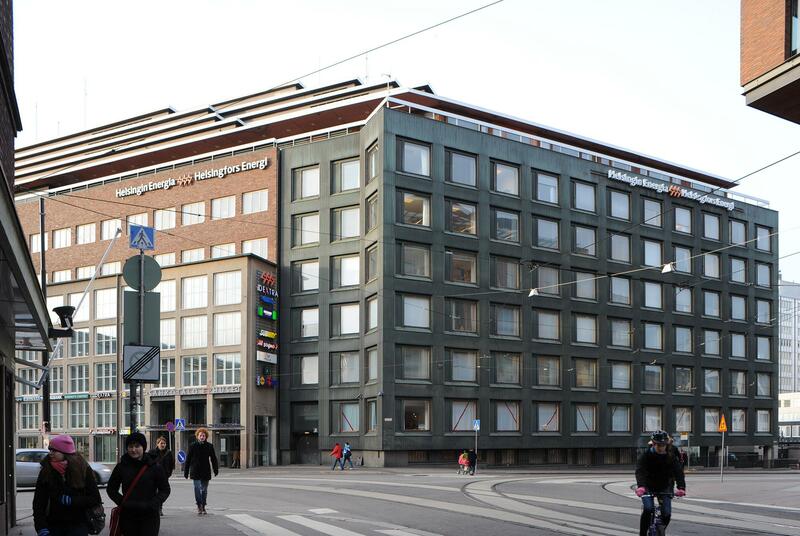 The building is still used for its original purpose and only a few alterations have been made, so Helsinki Energy Office Building has certainly withstood the passage of time well. The surrounding areas in Kamppi district have gone through some changes over the years. The latest change being the Kamppi Shopping centre that was built in 2006. Helsinki Energy Office Building is nowadays linked partially to the centre for example with its underground passage. After the renovations, a coffee shop was also opened at the Helsinki Energy Office Building customer-service floor. Sähkötalo is located in the city centre of Helsinki on Kampinkuja 2. The building is mainly in office use, but you can visit the coffee place located in the customer-service floor during their opening times.